Simon Says For a Child! Thank you for joining us for the Splatter It Challenge and we hope you will all join us again this week too. This week we are showcasing Neat and Tangled Products. You don’t have to use them for the challenge but if you have them we would love to see them used. 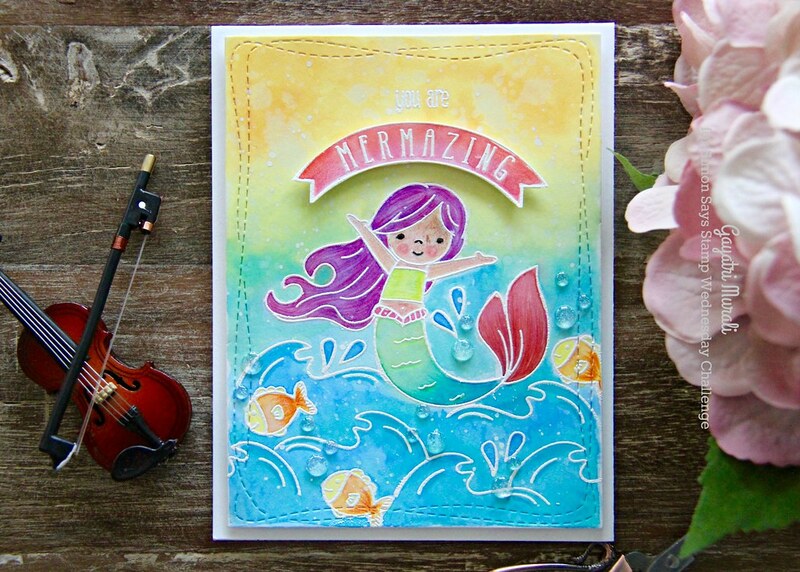 I love the Mermazing stamp set from Neat and Tangled. Perfect for a little girl’s card. I started with die cutting bristol paper using Simon Says Stamp Wonky Stitched Rectangle die. 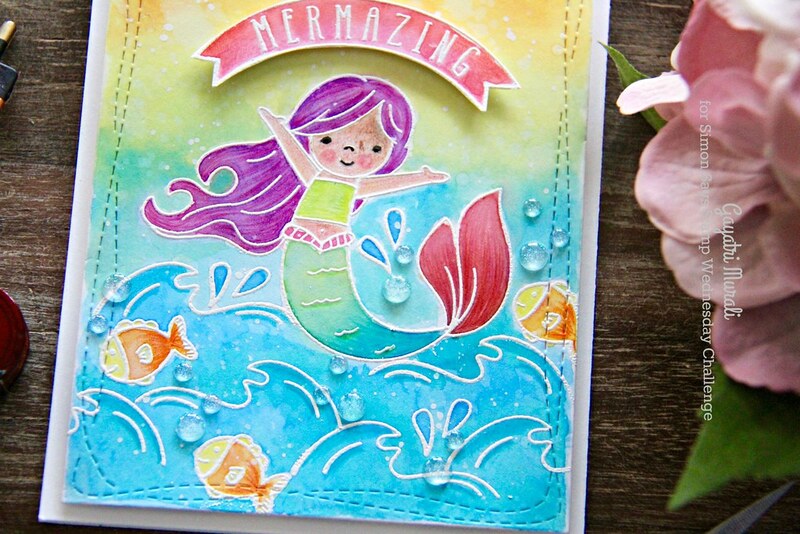 Then I stamped the images from the Mermazing stamp set using versmark ink and white heat embossed the images. The banner sentiment I white heat embossed on a scrap piece Bristol paper. I coloured everything using Distress Oxide inks. Reason being they were on the table ready to go. I was too lazy to find another medium to be honest. But the distress oxide inks worked well. I spattered clear water and white paint to add texture. To get depth to the colouring, I used Prisma colour pencils in darker shades. I also added shimmer on the mermaid and fishes using Wink of Stella clear shimmer pen. I adhered the panel on a white card base. I adhered the banner sentiment below the white heat embossed sentiment using foam adhesives. I used the sparkly white enamel dots from Your Next Stamp to add water droplets. The card turned out to be colourful and cute, don’t you think? So now it’s YOUR turn to make something for a child in your life and join in! You can find all the products used to make this card below. super cute Gayatri. Great challenge. 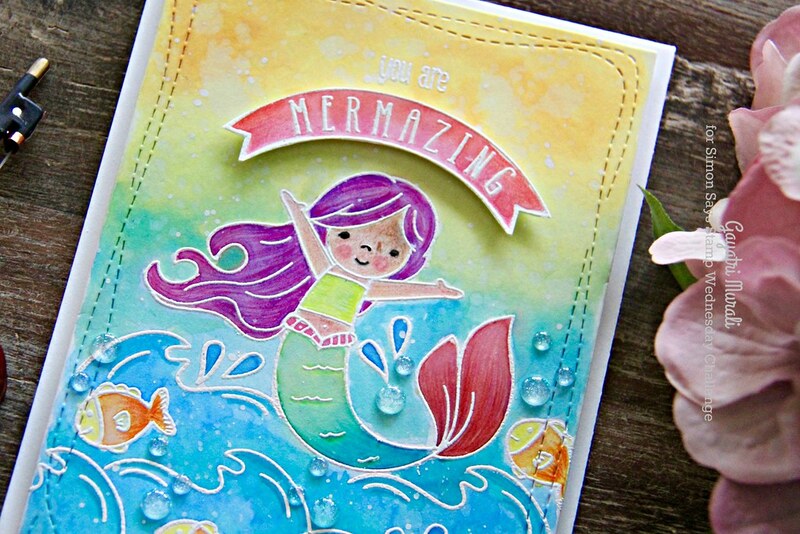 So sweet–love the white embossing with those beautiful colors!